Entertainment and Fashion Galore: Meet My New Scarf! This is my new summer scarf. Wondering why? It's summer here but still cold specially in the morning. 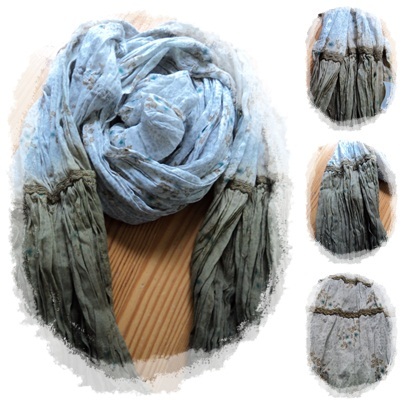 I saw this scarf in one of my favorite clothes boutique. Usually they sell expensive ones but this time they are into 70% off from the original price. This one is for summer use and could be in fall too. I like the simple color and of course the price is reasonable. Cool right? This entry was posted on 10:52 AM and is filed under Personal , Summer Scarf , Wfashion . You can follow any responses to this entry through the RSS 2.0 feed. You can leave a response, or trackback from your own site. That's a really nice scarf. I love the color! :) Would like to have something like that too, it's perfect for fall. love it.. perfect for this rainy day! nice scarf. take a photo when you wear it. I love it! I make sure I have a scarf or a shawl at work because it's freezing. Nice choice of color. Can be pair with a good jeans a nice top. I love scarves, however, I am often discouraged to buy one because it is rarely "chilly" or really cold in the Philippines (unless you are somewhere colder such as Baguio or Tagaytay). And sometimes, scarves tend to be so expensive, even if the cloth is not that special it is just sewn straight (I don't get it. Haha). I guess Summer scarves would be good to have as well. It looks cool and chic.